The Hague, W.P. 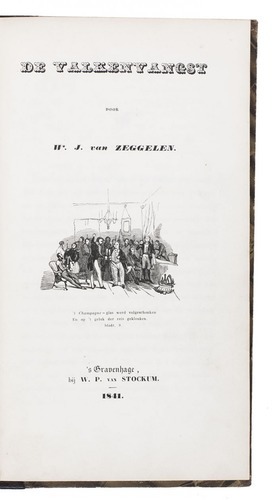 van Stockum, 1841. 8vo. 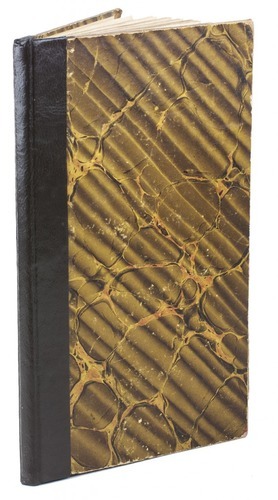 With a wood-engraved frontispiece by "I.B." (=Johannes Bosboom). Contemporary boards (rebacked in modern dark brown half morocco). 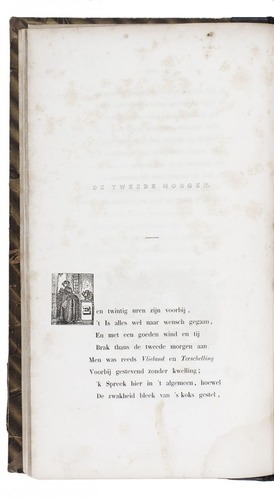 Very rare first edition of a poem satirising Dutch practitioners of falconry in the early 19th century, particularly the members of the famous Royal Loo Hawking Club. 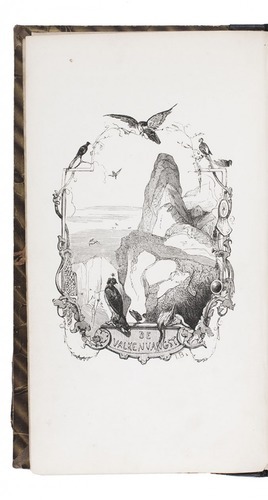 De valkenvangst (the capture of falcons) contrasts the majesty of the falcons, whose manner of hunting is described at the beginning of the poem, with the basal entertainment pursued by the "falconers", who believed that they could easily restore the forgotten art of falconry. 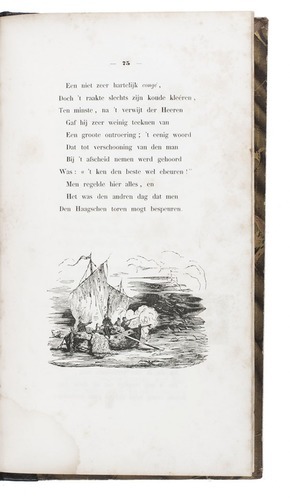 In the poem, a company including the Dutch baron Van Deelen and the Englishman Lord Littlewhit, travels to Norway to capture some falcons, parodying a real-life voyage in 1838. After numerous perils two white gyrfalcons are captured, while the noblemen amuse themselves with hunting and fishing. However, on the return voyage one of the falcons is accidentally shot and the other released by the baron's valet, who then puts a different bird in the cage. As the baron intends to reveal the falcon to his guests, a cockatoo is revealed. Binding worn at the edges. Foxed throughout and with water stains at the foot. Huyskens, De vrije vogelvlugt, pp. 84-93; Schwerdt II, p. 307; not in Harting; Lindner.